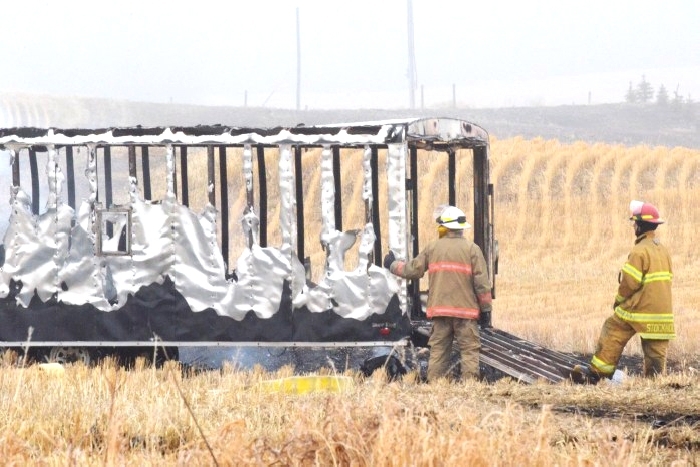 On Monday morning April 8th Esterhazy RCMP Detachment and Stockholm Fire Department responded to a fire involving a tow truck with an attached enclosed black cargo trailer. The tow truck and trailer were found burning, two miles west of Stockholm in a field. No one was located in the area with the vehicle / trailer. The public are being asked for information of anyone who was seen in the area. Anyone who has any information about the incident is asked to call 911 or 310-RCMP.